George II (George Augustus; German: Georg II. August; 30 October / 9 November 1683O.S./N.S. – 25 October 1760) was King of Great Britain and Ireland, Duke of Brunswick-Lüneburg (Hanover) and a prince-elector of the Holy Roman Empire from 11 June 1727 (O.S.) until his death in 1760. George was the last British monarch born outside Great Britain: he was born and brought up in northern Germany. His grandmother, Sophia of Hanover, became second in line to the British throne after about 50 Catholics higher in line were excluded by the Act of Settlement 1701 and the Acts of Union 1707, which restricted the succession to Protestants. After the deaths of Sophia and Anne, Queen of Great Britain, in 1714, his father George I, Elector of Hanover, inherited the British throne. In the first years of his father's reign as king, George was associated with opposition politicians, until they rejoined the governing party in 1720. As king from 1727, George exercised little control over British domestic policy, which was largely controlled by the Parliament of Great Britain. As elector, he spent twelve summers in Hanover, where he had more direct control over government policy. He had a difficult relationship with his eldest son, Frederick, who supported the parliamentary opposition. During the War of the Austrian Succession, George participated at the Battle of Dettingen in 1743, and thus became the last British monarch to lead an army in battle. In 1745, supporters of the Catholic claimant to the British throne, James Francis Edward Stuart ("The Old Pretender"), led by James's son Charles Edward Stuart ("The Young Pretender" or "Bonnie Prince Charlie"), attempted and failed to depose George in the last of the Jacobite rebellions. Frederick died unexpectedly in 1751, nine years before his father, so George II was ultimately succeeded by his grandson, George III. For two centuries after George II's death, history tended to view him with disdain, concentrating on his mistresses, short temper, and boorishness. Since then, most scholars have reassessed his legacy and conclude that he held and exercised influence in foreign policy and military appointments. 30 October / 9 November 1683O.S./N.S. George was born in the city of Hanover in Germany, and was the son of George Louis, Hereditary Prince of Brunswick-Lüneburg (later King George I of Great Britain), and his wife, Sophia Dorothea of Celle. His sister, Sophia Dorothea, was born when he was three years old. Both of George's parents committed adultery, and in 1694 their marriage was dissolved on the pretext that Sophia had abandoned her husband. She was confined to Ahlden House and denied access to her two children, who probably never saw their mother again. George spoke only French, the language of diplomacy and the court, until the age of four, after which he was taught German by one of his tutors, Johann Hilmar Holstein. In addition to French and German, he was also schooled in English and Italian, and studied genealogy, military history, and battle tactics with particular diligence. George's second cousin once removed, Queen Anne, ascended the thrones of England, Scotland, and Ireland in 1702. She had no surviving children, and by the Act of Settlement 1701, the English Parliament designated Anne's closest Protestant blood relations, George's grandmother Sophia and her descendants, as Anne's heirs in England and Ireland. Consequently, after his grandmother and father, George was third in line to succeed Anne in two of her three realms. He was naturalized as an English subject in 1705 by the Sophia Naturalization Act, and in 1706, he was made a Knight of the Garter and created Duke and Marquess of Cambridge, Earl of Milford Haven, Viscount Northallerton, and Baron Tewkesbury in the Peerage of England. England and Scotland united in 1707 to form the Kingdom of Great Britain, and jointly accepted the succession as laid down by the English Act of Settlement. George's father did not want his son to enter into a loveless arranged marriage as he had, and wanted him to have the opportunity of meeting his bride before any formal arrangements were made. Negotiations from 1702 for the hand of Princess Hedvig Sophia of Sweden, Dowager Duchess and regent of Holstein-Gottorp, came to nothing. In June 1705, under the false name of "Monsieur de Busch", George visited the Ansbach court at their summer residence in Triesdorf to investigate incognito a marriage prospect: Caroline of Ansbach, the former ward of his aunt Queen Sophia Charlotte of Prussia. The English envoy to Hanover, Edmund Poley, reported that George was so taken by "the good character he had of her that he would not think of anybody else". A marriage contract was concluded by the end of July. On 22 August / 2 September 1705O.S./N.S. Caroline arrived in Hanover for her wedding, which was held the same evening in the chapel at Herrenhausen. George was keen to participate in the war against France in Flanders, but his father refused permission for him to join the army in an active role until he had a son and heir. In early 1707, George's hopes were fulfilled when Caroline gave birth to a son, Frederick. In July, Caroline fell seriously ill with smallpox, and George caught the infection after staying by her side devotedly during her illness. They both recovered. In 1708, George participated in the Battle of Oudenarde in the vanguard of the Hanoverian cavalry; his horse and a colonel immediately beside him were killed, but George survived unharmed. The British commander, Marlborough, wrote that George "distinguished himself extremely, charging at the head of and animating by his example [the Hanoverian] troops, who played a good part in this happy victory". Between 1709 and 1713, George and Caroline had three more children, all girls: Anne, Amelia, and Caroline. By 1714, Queen Anne's health had declined, and British Whigs, politicians who supported the Hanoverian succession, thought it prudent for one of the Hanoverians to live in England, to safeguard the Protestant succession on Anne's death. As George was a peer of the realm (as Duke of Cambridge), it was suggested that he be summoned to Parliament to sit in the House of Lords. Both Anne and George's father refused to support the plan, although George, Caroline, and Sophia were all in favour. George did not go. Within the year, both Sophia and Anne were dead, and George's father was king. George and his father sailed for England from The Hague on 16/27 September 1714 and arrived at Greenwich two days later. The following day, they formally entered London in a ceremonial procession. George was given the title of Prince of Wales. Caroline followed her husband to Britain in October with their daughters, while Frederick remained in Hanover to be brought up by private tutors. London was like nothing George had seen before; it was 50 times larger than Hanover,A and the crowd was estimated at up to one and a half million spectators. George courted popularity with voluble expressions of praise for the English, and claimed that he had no drop of blood that was not English. In July 1716, the king returned to Hanover for six months, and George was given limited powers, as "Guardian and Lieutenant of the Realm", to govern in his father's absence. He made a royal progress through Chichester, Havant, Portsmouth, and Guildford in southern England. Spectators were allowed to see him dine in public at Hampton Court Palace. An attempt on his life at Drury Lane Theatre, in which one person was shot dead before the assailant was brought under control, boosted his high public profile. His father distrusted or was jealous of George's popularity, which contributed to the development of a poor relationship between them. The birth in 1717 of George's second son, Prince George William, proved to be a catalyst for a family quarrel; the king, supposedly following custom, appointed the Lord Chamberlain, the Duke of Newcastle, as one of the baptismal sponsors of the child. The king was angered when George, who disliked Newcastle, verbally insulted the duke at the christening, which the duke misunderstood as a challenge to a duel.B George and Caroline were temporarily confined to their apartments on the order of the king, who subsequently banished his son from St James's Palace, the king's residence. The Prince and Princess of Wales left court, but their children remained in the care of the king. George and Caroline missed their children, and were desperate to see them. On one occasion, they secretly visited the palace without the approval of the king; Caroline fainted and George "cried like a child". The king partially relented and permitted them to visit once a week, though he later allowed Caroline unconditional access. The following February, George William died, with his father by his side. Banned from the palace and shunned by his own father, the Prince of Wales was identified for the next several years with opposition to George I's policies, which included measures designed to increase religious freedom in Great Britain and expand Hanover's German territories at the expense of Sweden. His new London residence, Leicester House, became a frequent meeting place for his father's political opponents, including Sir Robert Walpole and Viscount Townshend, who had left the government in 1717. The king visited Hanover again from May to November 1719. Instead of appointing George to the guardianship, he established a regency council. In 1720, Walpole encouraged the king and his son to reconcile, for the sake of public unity, which they did half-heartedly. Walpole and Townshend returned to political office, and rejoined the ministry. George was soon disillusioned with the terms of the reconciliation; his three daughters who were in the care of the king were not returned and he was still barred from becoming regent during the king's absences. He came to believe that Walpole had tricked him into the rapprochement as part of a scheme to regain power. Over the next few years, Caroline and he lived quietly, avoiding overt political activity. They had three more children: William, Mary, and Louisa, who were brought up at Leicester House and Richmond Lodge, George's summer residence. In 1721, the economic disaster of the South Sea Bubble allowed Walpole to rise to the pinnacle of government. Walpole and his Whig Party were dominant in politics, as the king feared that the Tories would not support the succession laid down in the Act of Settlement. The power of the Whigs was so great that the Tories would not come to hold power for another half-century. George I died on 11/22 June 1727 during one of his visits to Hanover, and George II succeeded him as king and elector at the age of 43. The new king decided not to travel to Germany for his father's funeral, which far from bringing criticism led to praise from the English who considered it proof of his fondness for England. He suppressed his father's will because it attempted to split the Hanoverian succession between George II's future grandsons rather than vest all the domains (both in Britain and Hanover) in a single person. Both British and Hanoverian ministers considered the will unlawful, as George I did not have the legal power to determine the succession personally. Critics supposed that George II hid the will to avoid paying out his father's legacies. George II was crowned at Westminster Abbey on 11/22 October 1727. The composer George Frideric Handel was commissioned to write four new anthems for the coronation, including Zadok the Priest. It was widely believed that George would dismiss Walpole, who had distressed him by joining his father's government, and replace him with Sir Spencer Compton. George asked Compton, rather than Walpole, to write his first speech as king for him, but Compton asked Walpole to draft it. Caroline advised George to retain Walpole, who continued to gain royal favour by securing a generous civil list (a fixed annual amount set by Parliament for the king's official expenditure) of £800,000. Walpole commanded a substantial majority in Parliament and George had little choice but to retain him or risk ministerial instability. Compton was ennobled as Lord Wilmington the following year. Walpole directed domestic policy, and after the resignation of his brother-in-law Townshend in 1730 also controlled George's foreign policy. Historians generally believe that George played an honorific role in Britain, and closely followed the advice of Walpole and senior ministers who made the major decisions. Although the king was eager for war in Europe, his ministers were more cautious. The Anglo-Spanish War was brought to an end, and George unsuccessfully pressed Walpole to join the War of the Polish Succession on the side of the German states. In April 1733, Walpole withdrew an unpopular excise bill that had gathered strong opposition, including from within his own party. George lent support to Walpole by dismissing the bill's opponents from their court offices. George II's relationship with his son and heir apparent, Frederick, Prince of Wales, worsened during the 1730s. Frederick had been left behind in Germany when his parents came to England, and they had not met for 14 years. In 1728, he was brought to England, and swiftly became a figurehead of the political opposition. When George visited Hanover in the summers of 1729, 1732 and 1735, he left his wife to chair the regency council in Britain rather than his son. Meanwhile, rivalry between George II and his brother-in-law and first cousin Frederick William I of Prussia led to tension along the Prussian–Hanoverian border, which eventually culminated in the mobilization of troops in the border zone and suggestions of a duel between the two kings. Negotiations for a marriage between the Prince of Wales and Frederick William's daughter Wilhelmine dragged on for years but neither side would make the concessions demanded by the other, and the idea was shelved. Instead, the prince married Princess Augusta of Saxe-Gotha in April 1736. In May 1736, George returned to Hanover, which resulted in unpopularity in England; a satirical notice was even pinned to the gates of St James's Palace decrying his absence. "Lost or strayed out of this house", it read, "a man who has left a wife and six children on the parish." The king made plans to return in the face of inclement December weather; when his ship was caught in a storm, gossip swept London that he had drowned. Eventually, in January 1737, he arrived back in England. Immediately he fell ill, with piles and a fever, and withdrew to his bed. The Prince of Wales put it about that the king was dying, with the result that George insisted on getting up and attending a social event to disprove the gossip-mongers. When the Prince of Wales applied to Parliament for an increase in his allowance, an open quarrel broke out. The king, who had a reputation for meanness, offered a private settlement, which Frederick rejected. Parliament voted against the measure, but George reluctantly increased his son's allowance on the advice of Walpole. Further friction between them followed when Frederick excluded the king and queen from the birth of his daughter in July 1737 by bundling his wife, who was in labour, into a coach and driving off in the middle of the night. George banished him and his family from the royal court, much like the punishment his own father had brought upon him with the exception that he allowed Frederick to retain custody of his children. Soon afterwards, George's wife Caroline died on 20 November 1737 (O.S.). He was deeply affected by her death, and to the surprise of many displayed "a tenderness of which the world thought him before utterly incapable". On her deathbed she told her sobbing husband to remarry, to which he replied, "Non, j'aurai des maîtresses!" (French for "No, I shall have mistresses!"). It was common knowledge that George had already had mistresses during his marriage, and he had kept Caroline informed about them. Henrietta Howard, later Countess of Suffolk, had moved to Hanover with her husband during the reign of Queen Anne, and she had been one of Caroline's women of the bedchamber. She was his mistress from before the accession of George I until November 1734. She was followed by Amalie von Wallmoden, later Countess of Yarmouth, whose son, Johann Ludwig von Wallmoden, may have been fathered by George. Johann Ludwig was born while Amalie was still married to her husband, and George did not acknowledge him publicly as his own son. Against Walpole's wishes, but to George's delight, Britain reopened hostilities with Spain in 1739. Britain's conflict with Spain, the War of Jenkins' Ear, became part of the War of the Austrian Succession when a major European dispute broke out upon the death of Holy Roman Emperor Charles VI in 1740. At issue was the right of Charles's daughter, Maria Theresa, to succeed to his Austrian dominions. George spent the summers of 1740 and 1741 in Hanover, where he was more able to intervene directly in European diplomatic affairs in his capacity as elector. Prince Frederick campaigned actively for the opposition in the British general election of 1741, and Walpole was unable to secure a stable majority. Walpole attempted to buy off the prince with the promise of an increased allowance and offered to pay off his debts, but Frederick refused. With his support eroded, Walpole retired in 1742 after over 20 years in office. He was replaced by Spencer Compton, Lord Wilmington, whom George had originally considered for the premiership in 1727. Lord Wilmington, however, was a figurehead; actual power was held by others, such as Lord Carteret, George's favourite minister after Walpole. When Wilmington died in 1743, Henry Pelham took his place at the head of the government. The pro-war faction was led by Carteret, who claimed that French power would increase if Maria Theresa failed to succeed to the Austrian throne. George agreed to send 12,000 hired Hessian and Danish mercenaries to Europe, ostensibly to support Maria Theresa. Without conferring with his British ministers, George stationed them in Hanover to prevent enemy French troops from marching into the electorate. The British army had not fought in a major European war in over 20 years, and the government had badly neglected its upkeep. George had pushed for greater professionalism in the ranks, and promotion by merit rather than by sale of commissions, but without much success. An allied force of Austrian, British, Dutch, Hanoverian and Hessian troops engaged the French at the Battle of Dettingen on 16/27 June 1743. George personally accompanied them, leading them to victory, thus becoming the last British monarch to lead troops into battle. Though his actions in the battle were admired, the war became unpopular with the British public, who felt that the king and Carteret were subordinating British interests to Hanoverian ones. Carteret lost support, and to George's dismay resigned in 1744. Tension grew between the Pelham ministry and George, as he continued to take advice from Carteret and rejected pressure from his other ministers to include William Pitt the Elder in the Cabinet, which would have broadened the government's support base. The king disliked Pitt because he had previously opposed government policy and attacked measures seen as pro-Hanoverian. In February 1746, Pelham and his followers resigned. George asked Lord Bath and Carteret to form an administration, but after less than 48 hours they returned the seals of office, unable to secure sufficient parliamentary support. Pelham returned to office triumphant, and George was forced to appoint Pitt to the ministry. George's French opponents encouraged rebellion by the Jacobites, the supporters of the Roman Catholic claimant to the British throne, James Francis Edward Stuart, often known as the Old Pretender. Stuart was the son of James II, who had been deposed in 1688 and replaced by his Protestant relations. Two prior rebellions in 1715 and 1719 had failed. In July 1745, the Old Pretender's son, Charles Edward Stuart, popularly known as Bonnie Prince Charlie or the Young Pretender, landed in Scotland, where support for his cause was highest. George, who was summering in Hanover, returned to London at the end of August. The Jacobites defeated British forces in September at the Battle of Prestonpans, and then moved south into England. The Jacobites failed to gain further support, and the French reneged on a promise of help. Losing morale, the Jacobites retreated back into Scotland. On 16/27 April 1746, Charles faced George's military-minded son Prince William, Duke of Cumberland, in the Battle of Culloden, the last pitched battle fought on British soil. The ravaged Jacobite troops were routed by the government army. Charles escaped to France, but many of his supporters were caught and executed. Jacobitism was all but crushed; no further serious attempt was made at restoring the House of Stuart. The War of the Austrian Succession continued until 1748, when Maria Theresa was recognized as Archduchess of Austria. The peace was celebrated by a fête in Green Park, London, for which Handel composed Music for the Royal Fireworks. In the general election of 1747, the Prince of Wales again campaigned actively for the opposition but Pelham's party won easily. Like his father before him, the Prince entertained opposition figures at his house in Leicester Square. When the Prince of Wales died suddenly in 1751, his eldest son, Prince George, became heir apparent. The king commiserated with the Dowager Princess of Wales and wept with her. As her son would not reach the age of majority until 1756, a new British Regency Act was passed to make her regent, assisted by a council led by the Duke of Cumberland, in case of George II's death. The king also made a new will, which provided for Cumberland to be sole regent in Hanover. After the death of his daughter Louisa at the end of the year, George lamented, "This has been a fatal year for my family. I lost my eldest son – but I am glad of it ... Now [Louisa] is gone. I know I did not love my children when they were young: I hated to have them running into my room; but now I love them as well as most fathers." In 1754, Pelham died, to be succeeded by his elder brother, the Duke of Newcastle. Hostility between France and Britain, particularly over the colonization of North America, continued. Fearing a French invasion of Hanover, George aligned himself with Prussia (ruled by his nephew, Frederick the Great), the enemy of Austria. Russia and France allied with their former enemy Austria. A French invasion of the British-held island of Minorca led to the outbreak of the Seven Years' War in 1756. Public disquiet over British failures at the start of the conflict led to the resignation of Newcastle and the appointment of the Duke of Devonshire as prime minister and William Pitt the Elder as Secretary of State for the Southern Department. In April the following year, George dismissed Pitt, in an attempt to construct an administration more to his liking. Over the succeeding three months attempts to form another stable ministerial combination failed. In June, James Waldegrave, 2nd Earl Waldegrave, held the seals of office for only four days. By the start of July, Pitt was recalled, and the Duke of Newcastle returned as prime minister. As Secretary of State, Pitt guided policy relating to the war. Great Britain, Hanover and Prussia and their allies Hesse-Kassel and Brunswick-Wolfenbüttel were pitted against other European powers, including France, Austria, Russia, Sweden and Saxony. The war involved multiple theatres from Europe to North America and India, where British dominance increased with the victories of Robert Clive over French forces and their allies at the Battle of Arcot and the Battle of Plassey. George's son, the Duke of Cumberland, commanded the king's troops in northern Germany. In 1757, Hanover was invaded and George gave Cumberland full powers to conclude a separate peace. By September, however, he was furious at Cumberland's negotiated settlement, which he felt greatly favoured the French. George said his son had "ruined me and disgraced himself". Cumberland, by his own choice, resigned his military offices, and George revoked the peace deal on the grounds that the French had infringed it by disarming Hessian troops after the ceasefire. In the annus mirabilis of 1759 British forces captured Quebec and Guadeloupe. A French plan to invade Britain was defeated following naval battles at Lagos and Quiberon Bay, and a resumed French advance on Hanover was halted by a joint British–Hanoverian force at the Battle of Minden. By October 1760, George II was blind in one eye and hard of hearing. On the morning of 25 October, he rose as usual at 6:00 am, drank a cup of hot chocolate, and went to his close stool, alone. After a few minutes, his valet heard a loud crash and entered the room to find the king on the floor; his physician, Frank Nicholls, recorded that he "appeared to have just come from his necessary-stool, and as if going to open his escritoire". The king was lifted into his bed, and Princess Amelia was sent for; before she reached him, he was dead. At the age of nearly 77, he had lived longer than any of his English or British predecessors. A post-mortem revealed that the king had died as the result of a thoracic aortic dissection. George II was succeeded by his grandson George III, and was buried on 11 November in Westminster Abbey. He left instructions for the sides of his and his wife's coffins to be removed so that their remains could mingle. He is the most recent monarch to be buried in Westminster Abbey. George donated the royal library to the British Museum in 1757, four years after the museum's foundation. He had no interest in reading, or in the arts and sciences, and preferred to spend his leisure hours stag-hunting on horseback or playing cards. In 1737, he founded the Georg August University of Göttingen, the first university in the Electorate of Hanover, and visited it in 1748. The asteroid 359 Georgia was named in his honour at the University in 1902. He served as the Chancellor of Trinity College, Dublin, between 1716 and 1727, and in 1754 issued the charter for King's College in New York City, which later became Columbia University. The province of Georgia, founded by royal charter in 1732, was named after him. During George II's reign British interests expanded throughout the world, the Jacobite challenge to the Hanoverian dynasty was extinguished, and the power of ministers and Parliament in Britain became well-established. Nevertheless, in the memoirs of contemporaries such as Lord Hervey and Horace Walpole, George is depicted as a weak buffoon, governed by his wife and ministers. Biographies of George written during the nineteenth and first part of the twentieth century relied on these biased accounts. Since the last quarter of the twentieth century, scholarly analysis of surviving correspondence has indicated that George was not as ineffective as previously thought. Letters from ministers are annotated by George with pertinent remarks and demonstrate that he had a grasp of and interest in foreign policy in particular. He was often able to prevent the appointment of ministers or commanders he disliked, or sideline them into lesser offices. This academic reassessment of George II, however, has not totally eliminated the popular perception of him as a "faintly ludicrous king". His parsimony, for example, may have opened him to ridicule, but his biographers observe that parsimony is preferable to extravagance. Lord Charlemont excused George's short temper by explaining that sincerity of feeling is better than deception, "His temper was warm and impetuous, but he was good-natured and sincere. Unskilled in the royal talent of dissimulation, he always was what he appeared to be. He might offend, but he never deceived." Lord Waldegrave wrote, "I am thoroughly convinced that hereafter, when time shall have wore away those specks and blemishes which sully the brightest characters, and from which no man is totally exempt, he will be numbered amongst those patriot kings, under whose government the people have enjoyed the greatest happiness". George may not have played a strong role in history, but he was influential at times and he upheld constitutional government. Elizabeth Montagu said of him, "With him our laws and liberties were safe, he possessed in a great degree the confidence of his people and the respect of foreign governments; and a certain steadiness of character made him of great consequence in these unsettled times ... His character would not afford subject for epic poetry, but will look well in the sober page of history." From 9 November 1706 (O.S. ): Duke and Marquess of Cambridge, Earl of Milford Haven, Viscount Northallerton and Baron of Tewkesbury. 1 August 1714 (O.S.) – 27 September 1714 (O.S. ): His Royal Highness George Augustus, Prince of Great Britain, Electoral Prince of Brunswick-Lüneburg, Duke of Cornwall and Rothesay, etc. 27 September 1714 (O.S.) 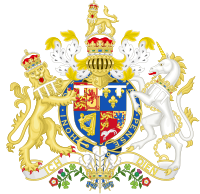 – 11/22 June 1727: His Royal Highness The Prince of Wales, etc. 11/22 June 1727 – 25 October 1760: His Majesty The King. George II's full style was "George the Second, by the Grace of God, King of Great Britain, France and Ireland, Defender of the Faith, Duke of Brunswick-Lüneburg, Archtreasurer and Prince-Elector of the Holy Roman Empire". When George became Prince of Wales in 1714, he was granted the royal arms with an inescutcheon of gules plain in the Hanoverian quarter differenced overall by a label of three points argent. The crest included the single arched coronet of his rank. As king, he used the royal arms as used by his father undifferenced. Caroline's ten pregnancies resulted in eight live births. One of their children died in infancy, and seven lived to adulthood. ^O.S./N.S. Over the course of George's life, two calendars were used: the Old Style Julian calendar and the New Style Gregorian calendar. Before 1700, the two calendars were 10 days apart. Hanover switched from the Julian to the Gregorian calendar on 19 February (O.S.) / 1 March (N.S.) 1700. Great Britain switched on 3/14 September 1752. George was born on 30 October Old Style, which was 9 November New Style, but because the calendar shifted forward a further day in 1700, the date is occasionally miscalculated as 10 November. In this article, individual dates before September 1752 are indicated as either O.S. or N.S. or both. All dates after September 1752 are N.S. only. All years are assumed to start from 1 January and not 25 March, which was the English New Year. ^A Hanover had about 1,800 houses, whereas London had 100,000. ^B George shook his fist at Newcastle and said "You are a rascal; I shall find you out! ", which the duke apparently misheard as "You are a rascal; I shall fight you!" ^ Van der Kiste, p. 6. ^ Black, George II, pp. 35–36; Thompson, p. 19; Van der Kiste, p. 7. ^ Trench, p. 7; Van der Kiste, p. 9. ^ Union with Scotland Act 1706 and Union with England Act 1707, The National Archives, retrieved 20 September 2011. ^ a b Van der Kiste, p. 17. ^ Van der Kiste, p. 15. ^ Thompson, p. 30; Van der Kiste, p. 16. ^ Thompson, p. 31; Van der Kiste, p. 18. ^ Van der Kiste, p. 19. ^ Van der Kiste, p. 21. ^ Thompson, p. 32; Trench, p. 18; Van der Kiste, p. 22. ^ Van der Kiste, p. 23. ^ Van der Kiste, p. 30. ^ Van der Kiste, p. 36. ^ Trench, p. 38; Van der Kiste, p. 37. ^ Thompson, pp. 39–40; Trench, p. 39. ^ Van der Kiste, p. 37. ^ Trench, p. 55; Van der Kiste, p. 44. ^ Trench, pp. 63–65; Van der Kiste, p. 55. ^ Van der Kiste, p. 59. ^ Black, George II, p. 45; Thompson, p. 47. ^ Trench, p. 75; Van der Kiste, p. 61. ^ Black, George II, p. 46; Thompson, p. 53; Trench, p. 78. ^ Van der Kiste, p. 66. ^ Van der Kiste, pp. 66–67. ^ Trench, pp. 67, 87. ^ Thompson, pp. 48–50, 55. ^ Trench, pp. 79, 82. ^ Van der Kiste, p. 71. ^ Thompson, p. 57; Trench, pp. 88–90; Van der Kiste, pp. 72–74. ^ Black, George II, p. 52; Thompson, p. 58; Trench, p. 89. ^ Black, George II, p. 54; Thompson, pp. 58–59. ^ Thompson, p. 45; Trench, p. 107. ^ a b Van der Kiste, p. 97. ^ Black, George II, p. 88; Cannon; Trench, pp. 130–131. ^ Black, George II, p. 77. ^ Black, George II, p. 80; Trench, p. 132. ^ Black, George II, pp. 81–84; Black, Walpole in Power, pp. 29–31, 53, 61. ^ Van der Kiste, p. 95. ^ Black, George II, p. 95. ^ Trench, pp. 173–174; Van der Kiste, p. 138. ^ Black, George II, pp. 141–143; Thompson, pp. 102–103; Trench, pp. 166–167. ^ Trench, pp. 141–142; Van der Kiste, pp. 115–116. ^ Thompson, pp. 85–86; Van der Kiste, pp. 118, 126, 139. ^ Van der Kiste, p. 118. ^ Trench, pp. 182–184; Van der Kiste, pp. 149–150. ^ Trench, p. 185–187; Van der Kiste, p. 152. ^ Van der Kiste, p. 153. ^ Black, George II, p. 136; Thompson, pp. 7, 64; Trench, p. 150. ^ Trench, pp. 189–190; Van der Kiste, pp. 153–154. ^ Thompson, p. 120; Trench, p. 192; Van der Kiste, pp. 155–157. ^ Trench, p. 196; Van der Kiste, p. 158. ^ Hervey's Memoirs, vol. III, p. 916, quoted in Thompson, p. 124, and Van der Kiste, p. 165. ^ Thompson, p. 124; Trench, p. 199. ^ Thompson, p. 92; Trench, pp. 175, 181. ^ Van der Kiste, pp. 25, 137. ^ Black, George II, p. 157; Kilburn; Weir, p. 284. ^ Thompson, pp. 133, 139. ^ Black, George II, p. 174; Trench, p. 212. ^ Black, George II, p. 86. ^ Black, George II, p. 111; Trench, pp. 136, 208; Van der Kiste, p. 173. ^ Thompson, p. 148; Trench, pp. 217–223. ^ Black, George II, pp. 181–184; Van der Kiste, pp. 179–180. ^ Black, George II, pp. 185–186; Thompson, p. 160; Van der Kiste, p. 181. ^ Black, George II, pp. 190–193; Thompson, pp. 162, 169; Trench, pp. 234–235. ^ Black, George II, pp. 164, 184, 195. ^ Black, George II, pp. 190–193; Cannon; Trench, pp. 234–235. ^ Van der Kiste, p. 184. ^ Black, George II, pp. 190–191. ^ Van der Kiste, pp. 186–187. ^ Black, George II, p. 199; Trench, p. 243; Van der Kiste, p. 188. ^ Van der Kiste, p. 189. ^ Thompson, p. 208; Trench, p. 247. ^ Black, George II, pp. 207–211; Thompson, p. 209; Trench, p. 249; Van der Kiste, p. 195. ^ Horace Walpole's memoirs, vol. I, p. 152, quoted in Thompson, p. 213 and Trench, p. 250. ^ Black, George II, pp. 231–232; Thompson, p. 252; Trench, pp. 271–274. ^ Thompson, pp. 265–266; Trench, p. 283. ^ Thompson, p. 268; Trench, p. 284. ^ Horace Walpole's memoirs, vol. III, p. 61, quoted in Trench, p. 286. ^ Thompson, p. 276; Trench, p. 286. ^ Thompson, p. 270; Trench, p. 287. ^ Thompson, p. 275; Trench, p. 292; Van der Kiste, p. 212. ^ Thompson, pp. 289–290; Van der Kiste, p. 213. ^ a b Nicholls, Frank (1761) "Observations concerning the body of His Late Majesty", Philos Trans Lond 52: 265–274. ^ Van der Kiste, p. 213. ^ Criado, Frank J. (2011) "Aortic dissection: a 250-year perspective", Texas Heart Institute Journal 38 (6): 694–700. ^ Black, George II, p. 253; Thompson, p. 290. ^ Van der Kiste, between pp. 150 and 151. ^ Black, George II, pp. 68, 127. ^ Black, George II, p. 127; Thompson, pp. 97–98; Trench, p. 153. ^ Black, George II, p. 128; Trench, pp. 140, 152. ^ Black, George II, p. 128. ^ Black, George II, pp. 255–257. ^ Black, George II, pp. 257–258. ^ Black, George II, pp. 258–259. ^ Black, George II, pp. 144–146; Cannon; Trench, pp. 135–136. ^ Black, George II, p. 195. ^ Black, George II, p. 82; Trench, p. 300; Lord Waldegrave's Memoirs quoted in Trench, p. 270. ^ Charlemont quoted in Cannon and Trench, p. 299. ^ Quoted in Trench, p. 270. ^ Black, George II, p. 138; Cannon; Trench, p. 300. ^ Quoted in Black, George II, p. 254. ^ e.g. "No. 5264". The London Gazette. 28 September 1714. p. 1. ^ Pinches and Pinches, p. 206. ^ a b c d e f Weir, pp. 272–275. ^ a b Haag et al., pp. 347–349. ^ Van der Kiste, p. 39. ^ Van der Kiste, p. 63. "Archival material relating to George II of Great Britain". UK National Archives. The Broad Bottom ministry consisted of two coalition administrations from 1744–46 and 1746–54 in the Parliament of Great Britain. It was led by the Pelham brothers, Henry Pelham as Prime Minister and the Duke of Newcastle as Secretary of State. Early in 1746 the king wished a change of Prime Minister, and Pelham lost power, but only briefly. Returning to office he put in place a strengthened broad coalition. The second Broad Bottom government lasted between Pelham's resumption of power and his death in 1754. Beyond the more senior ministers listed below, other significant figures in the ministry from 1746 were Henry Fox as Secretary at War and William Pitt as Paymaster of the Forces. The Carteret ministry was the ministry that was in office between 1742 and 1744 following the defeat of Sir Robert Walpole's ministry by a margin of 1 vote. At the head of the ministry was Spencer Crompton, The first Earl of Wilmington until his death in 1743. He was succeded at the role of prime minister by Henry Pelham. The ministry derived its name from John Carteret, 2nd Earl Granville. He was the secretary of state and somebody on whom the respective prime ministers were dependent on for support. Coagh (, from Irish: An Cuach, meaning "the hollow") is a small village in County Tyrone, Northern Ireland, five miles (8 km) east of Cookstown. Part of the village also extends into County Londonderry. It had a population of 545 people in the 2001 Census. It owes its existence to George Butle Conyngham of Springhill, and was founded in 1728 when King George II of Great Britain granted Conyngham a market charter allowing the village to host four fairs yearly. It is situated within Mid-Ulster District. The village nestles among gentle, low-lying land between the Sperrins and Lough Neagh. The main feature of the village is Hanover Square, which was named after the reigning Hanoverian George II by Conyngham. The village has been an ancient settlement for several thousand years; overlooking Coagh is Tamlaght Stone, a Mesolithic dolmen erected c. 4500 BCE. There are several extant statues of the king: in Golden Square, Soho, London; at Royal Square, St. Helier, Jersey; and at the Royal Naval College, Greenwich, London. Duke Alexander Paul Ludwig Konstantin of Württemberg (9 September 1804, Saint Petersburg – 4 July 1885 Tüffer) was the father of Francis, Duke of Teck and the grandfather of Mary of Teck, wife of George V of the United Kingdom. His father was Duke Louis of Württemberg, brother of King Frederick I of Württemberg and Empress Maria Feodorovna of Russia. His mother was Princess Henriette of Nassau-Weilburg, a great-granddaughter of George II of Great Britain through his eldest daughter Anne, Princess of Orange. From 1754 to 1756 the Duke of Newcastle headed the government of Great Britain. After the death of the previous Prime Minister, his brother Henry Pelham, Newcastle had formed a fresh administration. He remained in power until 1756, when his government collapsed following the fall of Minorca and the fierce criticism that he had come under for his handling of the war that was engulfing Europe. Among the most influential members of the Ministry was Henry Fox, who served as Leader of the House of Commons from November 1755, having firstly entered the Cabinet in his earlier position of Secretary at War in December 1754. Newcastle later returned to head a second government in 1757 in an alliance with William Pitt the Elder. Henrietta Howard (1689 – 26 July 1767) was a mistress of King George II of Great Britain. John Frederick, Margrave of Brandenburg-Ansbach (18 October 1654 – 22 March 1686) succeeded his father Albert II as margrave of Ansbach in 1667. He married his second wife Princess Eleonore Erdmuthe of Saxe-Eisenach on 4 November 1681. Their daughter Wilhelmine Charlotte Caroline, Margravine of Brandenburg-Ansbach (Caroline of Ansbach) married George II of Great Britain before he became king. The Music for the Royal Fireworks (HWV 351) is a suite for wind instruments composed by George Frideric Handel in 1749 under contract of George II of Great Britain for the fireworks in London's Green Park on 27 April 1749. It was to celebrate the end of the War of the Austrian Succession and the signing of the Treaty of Aix-la-Chapelle (Aachen) in 1748. The Pitt–Newcastle ministry governed the Kingdom of Great Britain between 1757 and 1762, at the height of the Seven Years' War. It was headed by Thomas Pelham-Holles, 1st Duke of Newcastle, who was serving in his second term as Prime Minister. The most influential and famous figure in the government however was William Pitt, who served as Secretary of State. The ministry ended a period of political instability, when Britain had struggled in the war. Pitt was a strong war leader, but lacked the support in parliament necessary to provide effective leadership. Newcastle provided this, as he has a strong base of support in the House of Commons. They divided duties between them: Pitt directed defence and foreign policy, while Newcastle controlled the nation's finances and patronage. The ministry was very successful leading Britain to many victories in the war, particularly in the so-called Annus Mirabilis of 1759, which put the country in an immensely strong position by 1761. That year Pitt resigned over a dispute concerning the entry of Spain into the war. The ministry had been under pressure since the death of the old King with the accession of King George III, who disliked both Pitt and Newcastle and favoured John Stuart, 3rd Earl of Bute. Bute had joined the Cabinet as Northern Secretary in March 1761, and following Pitt's resignation the ministry was sometimes referred to as the Bute–Newcastle coalition.In 1762 Newcastle was forced to resign, with his followers (the "Pelhamites") sacked by Bute in the "Massacre of the Pelhamite Innocents"; this is traditionally considered to have been the moment the ministry collapsed. Princess Caroline of Great Britain (Caroline Elizabeth; 10 June 1713 – 28 December 1757) was the fourth child and third daughter of King George II of Great Britain and his wife Caroline of Ansbach. Princess Mary of Great Britain (5 March 1723 – 14 January 1772) was the second-youngest daughter of King George II of Great Britain and his wife Caroline of Ansbach, and Landgravine of Hesse-Kassel as the wife of Landgrave Frederick II. Princess Sophia Matilda of Gloucester (29 May 1773 – 29 November 1844) was a great-granddaughter of King George II of Great Britain and niece of King George III. The Siege of Blair Castle was a conflict that took place in Scotland in March 1746 and was part of the Jacobite rising of 1745. It was fought between Scottish forces loyal to the British-Hanoverian government of George II of Great Britain, which defended Blair Castle near the village of Blair Atholl in Perthshire, and Scottish Jacobite forces loyal to the House of Stuart. Thomas Dunckerley (23 October 1724 – 19 November 1795) was a prominent freemason, being appointed Provincial Grand Master of several provinces, promoting Royal Arch masonry, introducing Mark Masonry to England, and instituting a national body for Templar masonry. This was made possible by an annuity of £100, rising to £800, which he obtained from King George III by claiming to be his father's illegitimate half brother. The British Whig government of 1730–42 was led by Sir Robert Walpole. The Walpole–Townshend ministry lasted between 1721 and 1730.